Discussion in 'Online Games - News and Reviews' started by Kotsy, Nov 23, 2012. 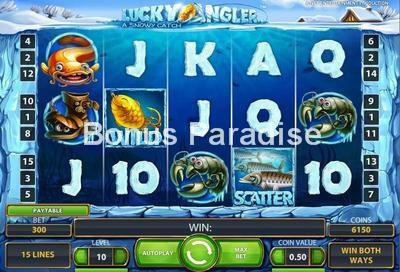 Net Entertainment continues with their great video slots.Lucky Angler, An underwater theme featured within a frozen lake. Time to catch some of these great fish. Scatter symbols, free spins and more. Lucky Angler™A Snowy Catch has it all. Dependent on lines played, number of coins and coin value, your bet per spin will vary. Minimum bet with all lines played is .30 to a maximum of 150.00. All wins pay left to right and right to left. (both ways) Sticky Wild substitutes for all symbols except the scatter. In the main game, Sticky Wild only appears on reels 2 and 4. Sticky Wild will stay until there are no more winning combinations. Should Sticky Wild stay, your winnings could be great. During free spins, it appears only on reels 2, 3 and 4. Again, your amount of wins could be increased. Lucky Angler is a great addition to the Netent video slot collection. Enjoy playing it at Redbet Casino. This is one video slot worth playing.